Want more freedom, gratitude + badassery in your life? Estimated read time: Maybe 1 little minute. The word badassery is fun to say so let's say it as many times as we can. Badassery, badassery, badassery. It's Thanksgiving in the USA tomorrow, and I am so, so grateful - for my family's health, for the love that surrounds us, and for all of you. I'll be giving thanks in a big way. The whipped cream on the pecan pie was being invited to participate in my dear friend, Sandra's, interview series, Unleash Your Inner Badass. What she calls badassery (said it again! 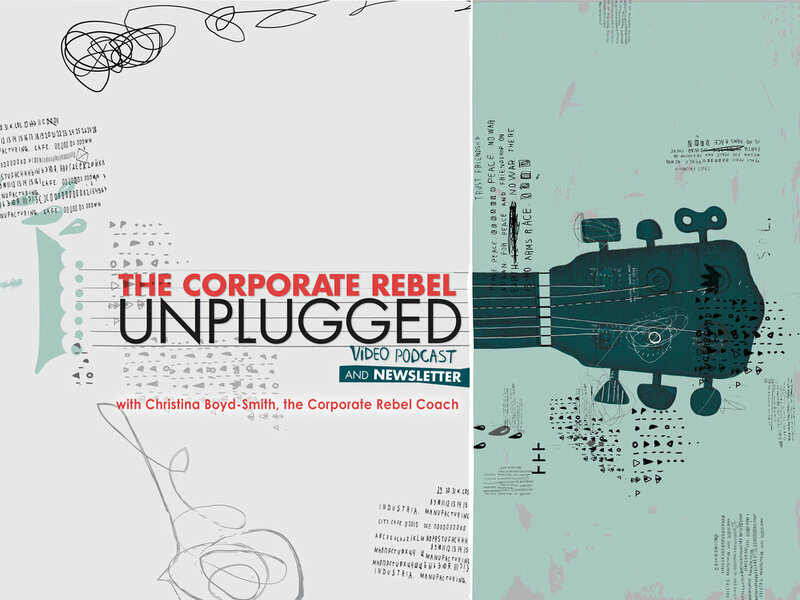 ), we in Corporate Rebel Land call rebelicious. Thanksgiving is not a traditional gift-giving holiday, and we don't do things the traditional way around here. Too many people settle for mediocrity, become victims of their circumstances, and simply complain about the way things are. I don’t think that’s you, though. I think you are someone who sees the value of investing in yourself, training your mind, and taking responsibility for your life and the world around you. That's why I said yes to Sandra (and because I just downright love her). I'm careful with your time and only put things of real value in front of you. Sandra has produced a series of interviews that are fun and meaningful. build a new, more badass (rebelicious), reality for yourself. If you're too busy eating and watching the National Dog Show to catch our entertaining and real interview on Thanksgiving, no worries. It will be available for 72 hours. And all the interviews will be available starting December 1 so you can gorge yourself like a Thanksgiving feast. The movers put my sense of humor in here somewhere. Do you see it? I've been thinking of you all week. My family and I moved on Monday into our "being renovated" 100-year-old house. There are boundless lessons in the dust, the pile of furniture, and the fact that we have no working toilet. Don't ask. Gratitude got me through a complete panic on Monday night. Letting go will help me live in the chaos that will be our lives for a few months. Then there's the no toilet thing. Oh, the lessons that are here for you. There's one lesson, though, that kept coming back all week. Throughout this entire transition, our people have shown up to bring food, help with cleaning, take our children, and offer moral support. When one of the movers handed me a sandwich, I almost cried. When our painters said they could come on Tuesday, I did cry. I've gotten some great ideas for kindness and generosity from our people. Who are your people? The ones who will drop everything to clean walls. The ones who will give you late-night feedback on an important presentation. The ones who will walk around the block with you when you are angry or disappointed or sad. The ones who will offer you a sandwich in the moment you share together. Your world is full, and it can be easy to head straight for your computer in the morning. Instead, find a moment or two each day to nurture your people, to show them some love, even the people you will only know for a few days or a few minutes. We are not meant to do this life thing alone. And you never know when you might need to use their toilet. With so much gratitude and love this week.